Highlights include a laser printer that’s so old it’s also a fax (shame there’s no landline to connect it to), my cassette player/radio from the ‘80s (still works), an I Heart NY mug I bought on my last trip to the US, and a bird’s nest fern I received as a KK gift nearly two years ago. What does your workspace look like? I would LOOOVE to see! 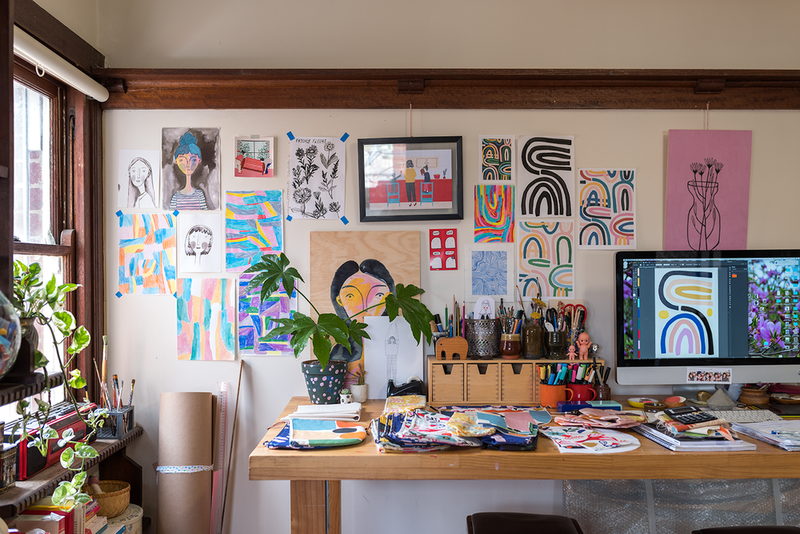 Tegan Iversen in her Fitzroy studio. Photo © Susan Fitzgerald 2017. 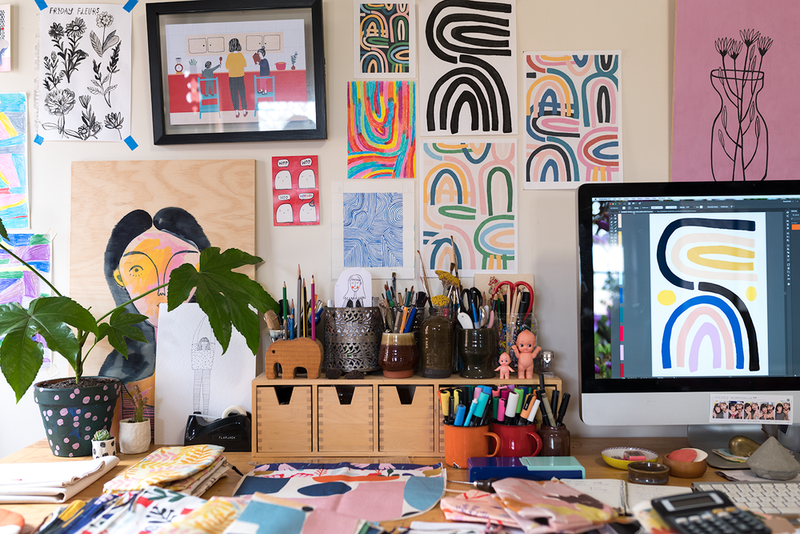 It's been a while but Studio Space is back, this time featuring the super cute workspace of Tegan Iversen, a Melbourne-based artist and illustrator. 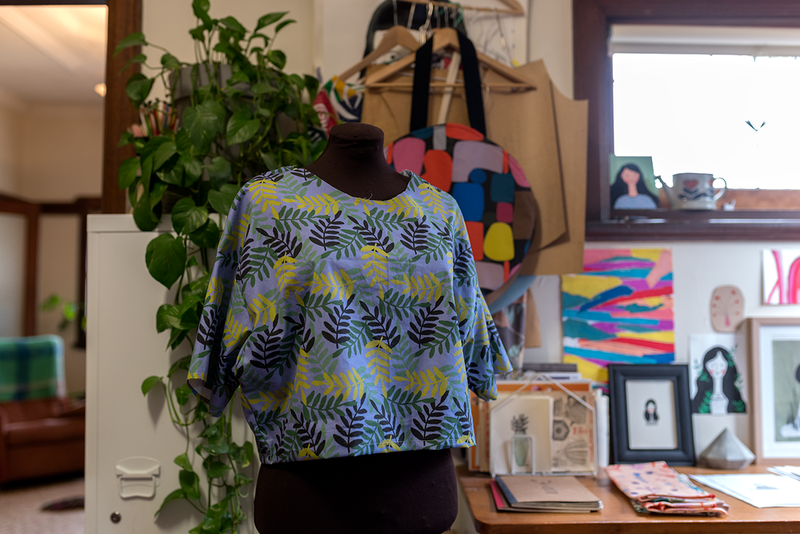 Tegan shares her light filled studio with another creative, Lara from label Eat Me Do. 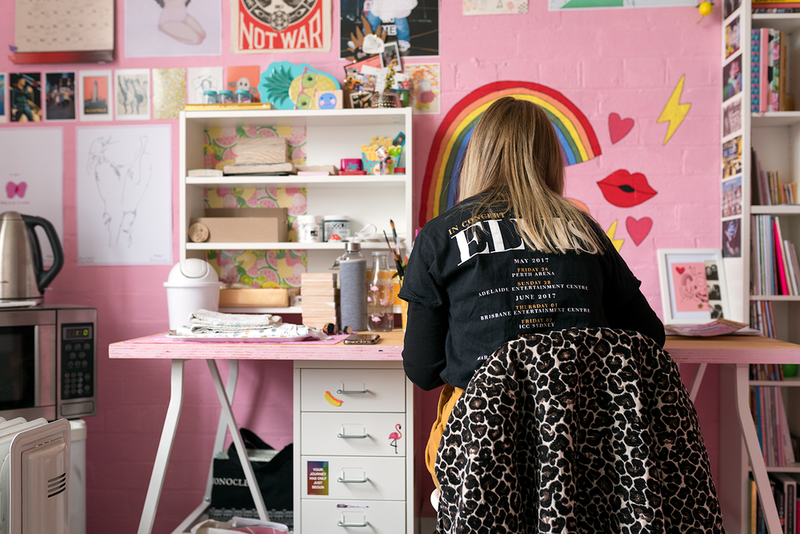 There are contrasting white and pink walls, with the space above Tegan's desk featuring her own colourful hand-drawn illustrations of rainbows, lips, hearts and lightning bolts. There's also a feature wall hand painted by textile designer Abbey Rich. The east-facing window looks over Brunswick St, Fitzroy, where you can do lots of people watching (and also see Adam Bandt of The Greens' office). Tegan studied fine arts (drawing) at the Victorian College of the Arts and since graduating in 2014 has been super prolific, exhibiting her work in a number of solo and group shows and co-running F*EMS Zine. She's also done lots of freelance work, for clients including AHD Paper & Co, Voiceworks Magazine, Filmme Fatales and The Big Issue. Most of Tegan's work starts out as a pencil sketch on paper, which is then drawn over with pen, scanned and digitally coloured. She's also working on a project where she's replicating music and film tickets, hand painting the lettering directly onto small blocks of wood using a super fine brush. Interestingly, Tegan doesn't have a computer in her studio, which means she can devote her work time to painting and drawing without too many distractions. She then does all the scanning and computer-based work in batches, when she gets home. What a great idea! How long have you been in your current workspace and where did you work from previously? I've only been in the space for a couple of weeks! I have a desk in my bedroom at home that I used to work from, as well as drawing in the lounge room on the couch sometimes. Yours is a shared space. How many other people work in the space? Do you prefer working alone or with/near others? I share a space with Lara from Eat Me Do. It's really great as we both love colour and making quirky & cute work. It's fun sharing a space as you can get feedback whilst working & can bounce ideas and thoughts off one another & we also get time in the studio by ourselves which is nice too. Sometimes I'll work there late by myself. I find I'm most creative towards the end of a day. How many hours a week do you spend there? Probably around 20 hours or so. I have two full days to spend in the studio every week and other times, mornings & nights, when I can just pop in. I have other work commitments at the moment on top of my art stuff, otherwise I would spend more time in there. What's your favourite thing about the space? Having a place solely for art making is super awesome & I love that I'm able to decorate the space to make it feel like me. One of my favourite aesthetic things about the studio is actually the floor - I've always wanted checkerboard flooring, omg I love it! How, if at all, has a workspace (this or previous) influenced the way you work? Having a place to make art outside of my home has definitely encouraged me to experiment a lot more with my art making - to take more risks, try different techniques & make larger scale work. It's given me the time to try painting, which I've always wanted to do. What does your dream space look like? Probably very similar to what this space looks like, but just more physical space, which of course I would then fill with lots more stuff! What inspires your work? Definitely colour, patterns, movies I see, things I do, places I go. Also my friends, family & all the amazing artists I follow on Insta, as well as visiting galleries & reading cute zines. Do you have any tips for great things to do in your work hood? Omg there are so many great things around here, I am forever tempted to go buy tasty food & go shopping & go out for dranks every time I'm in the studio! There is the very delicious Vegie Bar & Attaboy Roy who has an amazing halloumi burger, Naked for Satan for drinks, Brunswick Street Gallery is just down the road & not too far away on Smith St is In.cube8r & Junior Space that both have beaut art & lots of sweet handmade things! Finally, music or no music when you're working. Or podcasts? I love listening to something while I work. If Lara is in we'll listen to music otherwise if I'm in there solo I usually listen to podcasts. At the moment I've been enjoying listening to podcasts about art whilst I make art, such as Starving Artist and Wowee! podcast. Tegan Iversen in her studio. Photo © Susan Fitzgerald 2017. Tegan's tiny hand painted tickets. Photo © Susan Fitzgerald 2017. Some of the cards Tegan's designed for AHD Paper & Co. Photo © Susan Fitzgerald 2017. Some of Tegan's zines. Photo © Susan Fitzgerald 2017. Studio detail. Photo © Susan Fitzgerald 2017. Tegan in her studio. Photo © Susan Fitzgerald 2017. Eat Me Do wall mural by Abbey Rich. Photo © Susan Fitzgerald 2017. The view out the window, looking over Brunswick St. Photo © Susan Fitzgerald 2017. 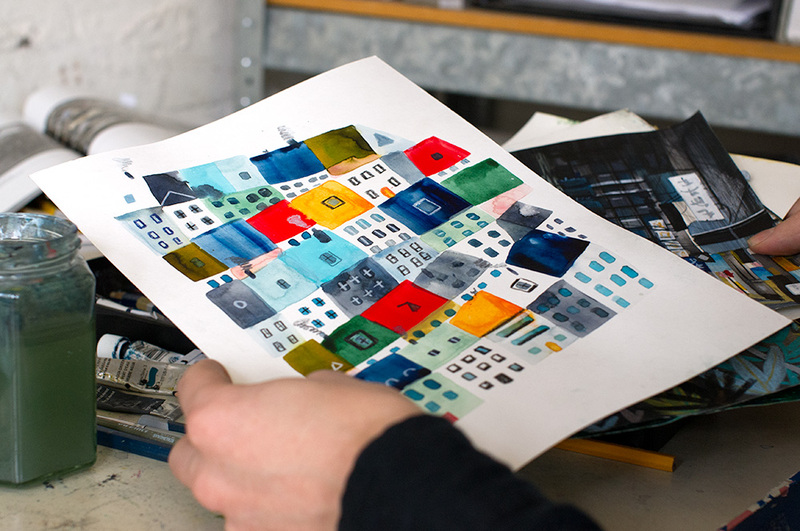 The latest instalment of Studio Space features Marc Martin, a Melbourne-based Illustrator. Marc's light-filled studio is located above a store in the outskirts of the city. 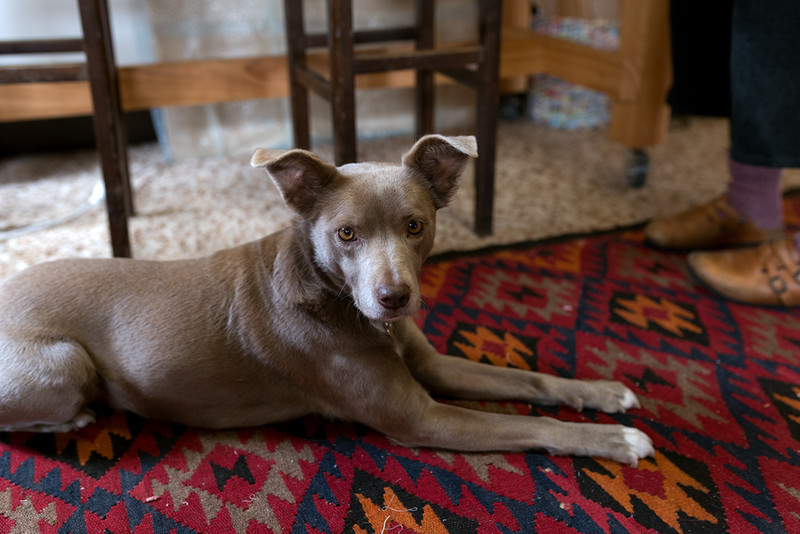 He shares the open-plan space with a group of other creatives, some indoor plants & occasionally, a dog. His space is bright and well equipped, with a workbench, a collection of books and magazines (for reference and inspiration), lots of art supplies and of course, a computer and scanner. One of the best things about the setup is it allows him to stand up while working, which he does about 50% of the time. His background is in graphic design and in the past Marc ran a design studio with a friend, before deciding to become a full-time illustrator about four years ago. He works mainly in watercolour and his work is evocative, rich in detail and colour. And one of the biggest breakthroughs he discovered a little while back - a hairdryer! It now plays an integral part in the process of producing his work (hope I'm not giving away your trade secrets, Marc!) - no more smudges. Marc has written numerous books, published through Penguin in English and other languages, including A River, A Forest, Max and The Curious Explorer's Illustrated Guide To Exotic Animals. He's just finished his latest book, details of which are yet to be revealed. He's also interested in the creative freedom self-publishing offers and is looking to self-release a book next year. Marc also works as a freelance illustrator and is represented by the Jacky Winter Group. Some of his freelance clients include Monocle magazine, Wired magazine, The Financial Review, Virgin Atlantic, Assemble Papers and ACMI. He's also designed and illustrated material for various festivals. He says a good balance for him is 50% client illustration work and 50% self-directed book work. How long have you been in the space and where did you work from previously? I’ve been here for about 5 or 6 years. Every now and then I get tempted to move, but this space is just so central and full of great people, so there’s really no reason to look anywhere else. Yours is a shared space. How many other people work in the space? About 15 people. It’s a mix of photographers, designers, artists, writers, people studying and other creative pursuits. It’s a good bunch of people. Do you prefer working alone or with others? In terms of a working space, I definitely prefer working with others around. It’s nice to be able to go to a space where you can get some work done, but also have the ability to chat to people and be social if you need to be. I worked form home for while, and that just made me feel very isolated. How many hours a week do you spend there? A full working week, so pretty much 9-5, Monday to Friday. I think it’s important to treat being an artist like any other job, especially if you want to be successful at it. How, if at all, has the space influenced the way you work? I’ve been here so long that it’s hard to say if the space has influenced my work. I know I’ve changed the way I use the space - initially I was just doing all computer based work, and slowly I’ve migrated to pretty much all hand drawn things these days. So less sitting and staring at the screen and more active, gestural work with paint and paper. What does your dream space look like? It probably looks something like a log cabin in the woods somewhere, with a big window overlooking a lake where I can sit and make art. What inspires you, personally or professionally? Friends, nature, travel, film, books, art, photography. I’m just about to head off on a long-deserved holiday to Ningaloo reef, so I’m pretty sure some time snorkelling, swimming with whale sharks and driving through national parks will get me inspired too! Marc holding one of his books, A River. Photo by Susan Fitzgerald. Marc working at his computer. Photo by Susan Fitzgerald. One of Marc's studio mates and her dog. Photo by Susan Fitzgerald. Bookshelf. Photo by Susan Fitzgerald. Marc's workspace including standing desk. Photo by Susan Fitzgerald. Studio windows from the road. Photo by Susan Fitzgerald. All photos copyright Susan Fitzgerald 2016. Chizu and Chihiro from Fog Linen and Kaori from Tea & Treats, who was holding a tea class in the second floor event space. 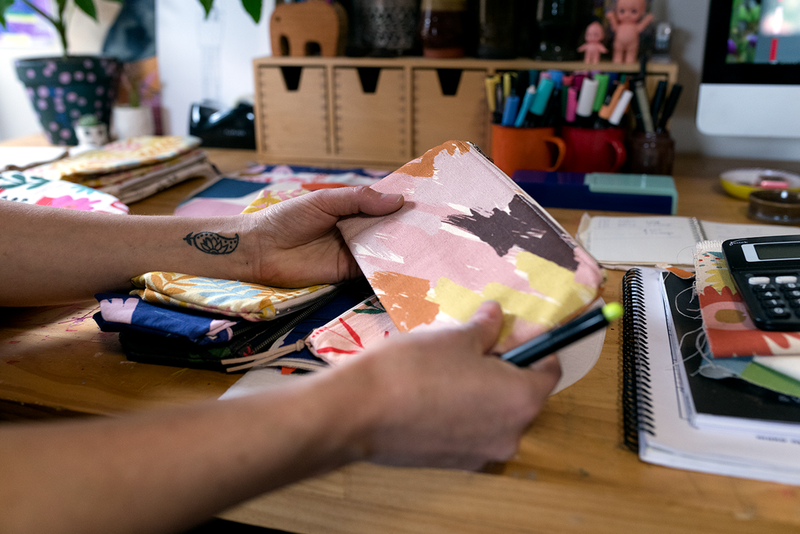 Today I'm so excited to share the first international studio visit - when I was in Japan I visited the very zen workspace and shop of Yumiko Sekine of Fog Linen Work. Unfortunately, Yumiko was overseas when I was in Tokyo but some of her trusty staff showed me around and made me feel welcome. The four-level space was custom designed and built just for Fog Linen and the business seems to fill the space perfectly, with a retail space on the ground floor, event space on the second floor, office on the third floor and a meeting room and storage space on the fourth floor. Never before have I seen such neat filing & storage - I felt like I was in a Muji or IKEA showroom! Around 18 years ago Yumiko visited Lithuania, one of Europe's major growers of flax and producers of linen products. She was disappointed to discover that while being a major exporter of linen products, you could not buy everyday linen products in Lithuania. She contacted a number of linen manufacturers and soon began production of her own product designs in Lithuania. 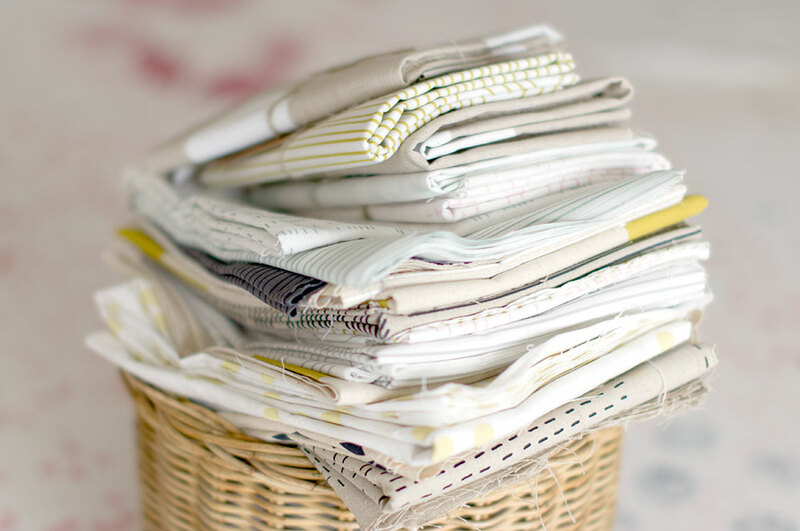 Fog Linen Work now produces a large range of beautiful and functional everyday linen and household products including kitchen wares, clothing, trays and wire ware. How long have you been in the space and where did you work from previously? 5 years. We were in another building in the same area before moving into current space. My boyfriend is the architect and he designed our current building. How many people work in the space? I have 8 assistants, so 9 including me. You designed and built your current four-level workspace in Tokyo. Can you talk a little about this - how did you decide how much space you needed, how many floors you needed? There was a height limit and it couldn’t be higher than now for this area and space. When we bought the space, we knew we can make a 4 storey building. So I planned 4 different things to do for each floor. 1st floor : store. 2nd floor : event space. 3rd floor : office. 4th floor: meeting, storage. How many hours a week do you spend in your workspace? 60 hours ~ more?? Sometimes I work by myself during the weekend. How, if at all, has the space influenced the way you? We have moved office 6 times since I started my own business. New spaces always brought something new. Before we rent the space, though this building is designed for us. It fits perfect for our store and made good balance and mood. Which inspire you (personally or professionally)? Travelling. There was a tea ceremony being held in the event space on the morning I visited. It was all set up when I had a look through and the class arrived just as I was leaving. What a great morning they would have had! The custom designed and built building is in a relatively quiet street. You can see the three main levels and the smaller, fourth storage area at the top. There's also a balcony area which looks pretty great. Kristy in her studio. Photo by Susan Fitzgerald. Fox & Ramona is Melbourne-based brand creating bold and unique hand painted concrete planters, homewares & jewellery. The person behind the brand is Kristy Tull and I had the pleasure of visiting her studio/workshop this month. 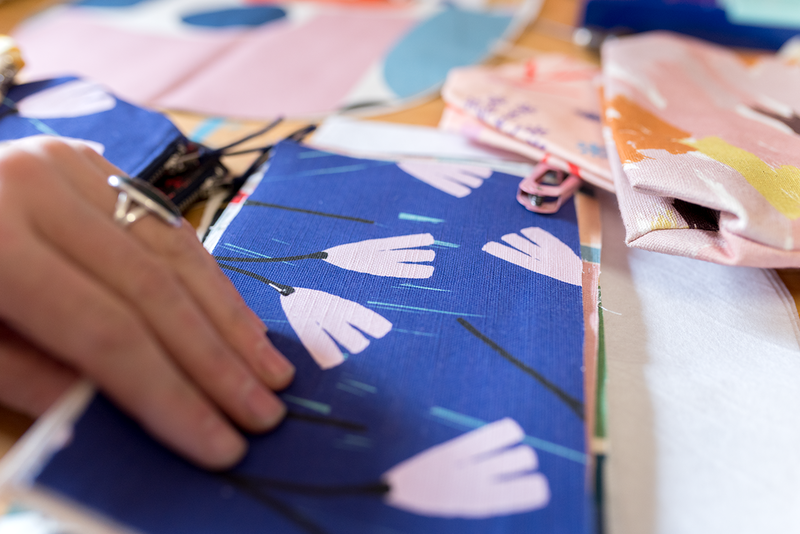 Kristy's been in her current workshop, situated in the inner west, since earlier this year. 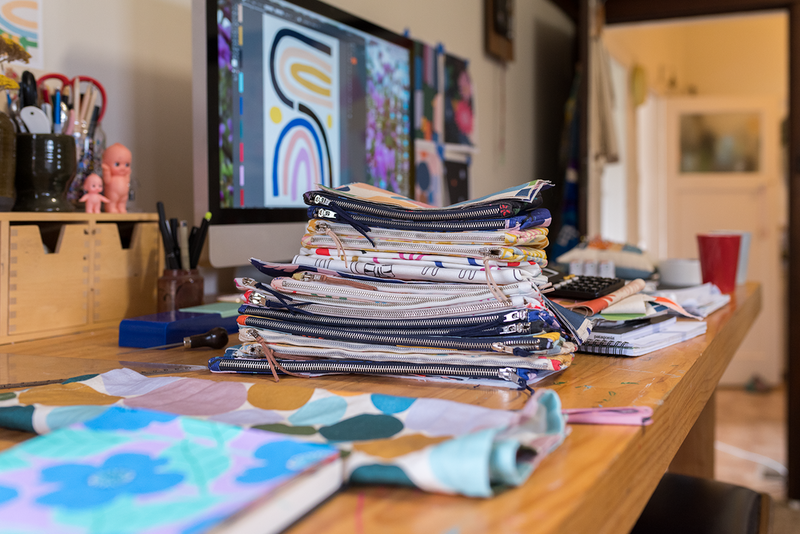 It's amazing how well she's settled in and how she's filled the huge space with all her creations, especially as she was working from home before this! Kristy started out making resin and polymer jewellery while working as an assistant in an architecture firm. She began experimenting with concrete to make small planters and didn't look back - two years ago she quit her day job and started working on Fox & Ramona full time. It seems she's come full circle, having just introduced some fabulous concrete jewellery (here and here) to the range. How long have you been in the space and where did you work previous to this? I’ve been here for almost 4 months and beforehand worked from home. I’d taken over my garage, living room and dining table so it was time to move out! How many hours a week do you spend in your workspace? About 30 hours a week in the workshop. Most computer/admin work I take home and do in the evenings - hence why I always send emails late at night…! How, if at all, has the space influenced your work? I wouldn’t say it's influenced my work as such but it has definitely made life easier, being able to spread out and get messy. If anything it's given me a chance to work on some new projects and designs which I wouldn’t have been able to do at home. What would your dream workspace look like? Concrete floors, white or exposed brick walls, bright, light and with a big roller door. Preferably in Spotswood, so I could walk to work from home! Do you prefer working alone or with others? A bit of both. I love having company at the workshop and often have my recently retired Dad pottering around me, which is really nice. It’s also good to have some downtime, thinking time and design time without any interruptions. Rachel Castle - I love the way she uses shapes and colour. Marnie Hawson - my photographer/stylist extraordinaire - she always captures simply gorgeous photos. Gorman - Their use of colour and out-of-the-box designs. Large painted concrete planters. Photo by Susan Fitzgerald. Small marbled vessels, planters and plates. Photo by Susan Fitzgerald. Grid concrete planter. Photo by Susan Fitzgerald. A selection of the larger-sized concrete planters in the Fox & Ramona range. Photo by Susan Fitzgerald. The back wall of the studio. Photo by Susan Fitzgerald. THE best packing station, complete with massive rolls of bubble wrap and every other thing you could ever need. Photo by Susan Fitzgerald. Packing an order. Photo by Susan Fitzgerald. So many paint brushes! Photo by Susan Fitzgerald. Testing new colours and patterns. Photo by Susan Fitzgerald. Kristy hard at work. Photo by Susan Fitzgerald. White Wash planters all lined up and in size order. Photo by Susan Fitzgerald. Hand painted. Photo by Susan Fitzgerald. The exterior of the studio. Photo by Susan Fitzgerald. So many beautiful plants! Photo by Susan Fitzgerald. Some mugs Kristy made for an upcoming workshop. Photo by Susan Fitzgerald. So cool! Made by Kristy for an upcoming workshop. Photo by Susan Fitzgerald. I think I keep away from Pinterest for fear of falling into a pit of beautiful fun...plus I already spend way too much time on Instagram, I don't need another addiction. 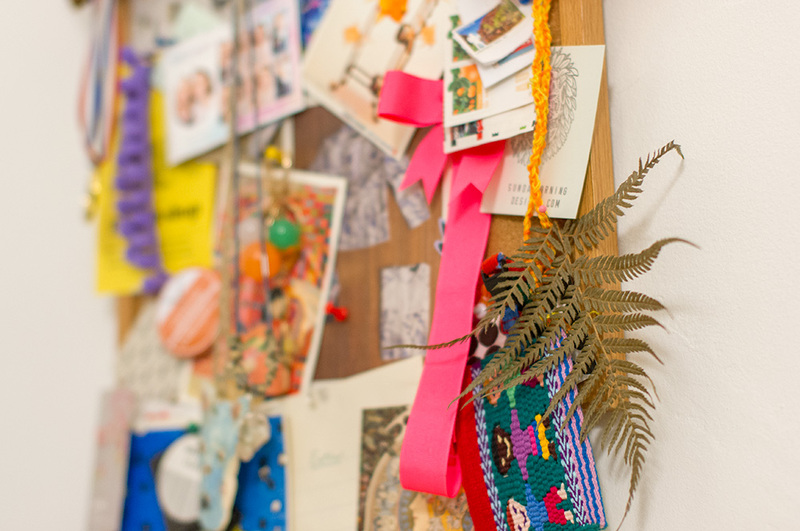 But I spent some time there today, pinning a bunch of Studio Space pictures. So. Fun. See here. 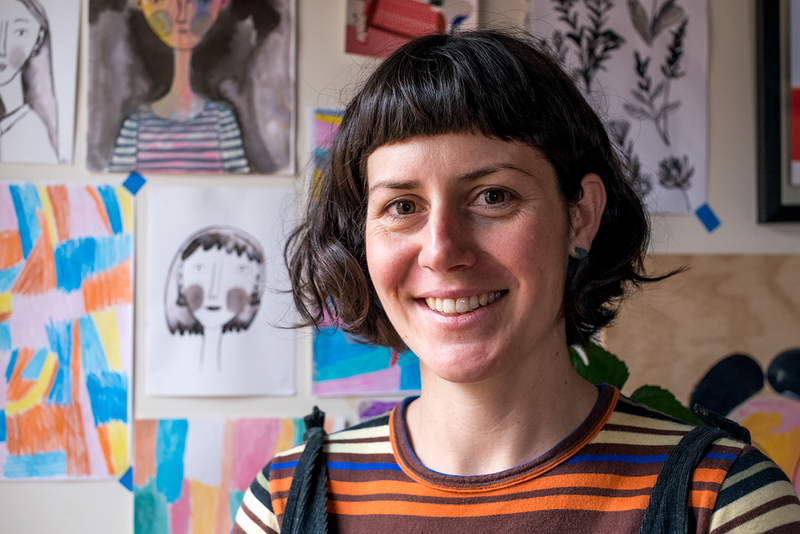 Madeleine Stamer, of Little Circus Design, is a Melbourne-based artist, illustrator, visual art teacher and all-round clever, super lovely person. 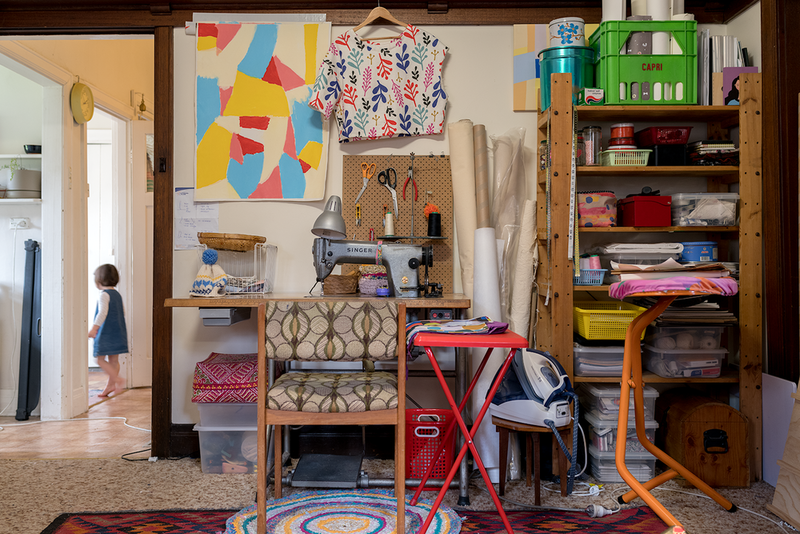 When I stumbled across an Instagram photo of her brand new, custom-built studio early this year, I was blown away. It looked like the perfect little place to work, a stand-alone building in the backyard of the amazing house she shares with her husband Karl and two daughters, Wilhelmina and Ada. I'm so glad she was happy to let me loose in the space and snap away, so I can share it here! 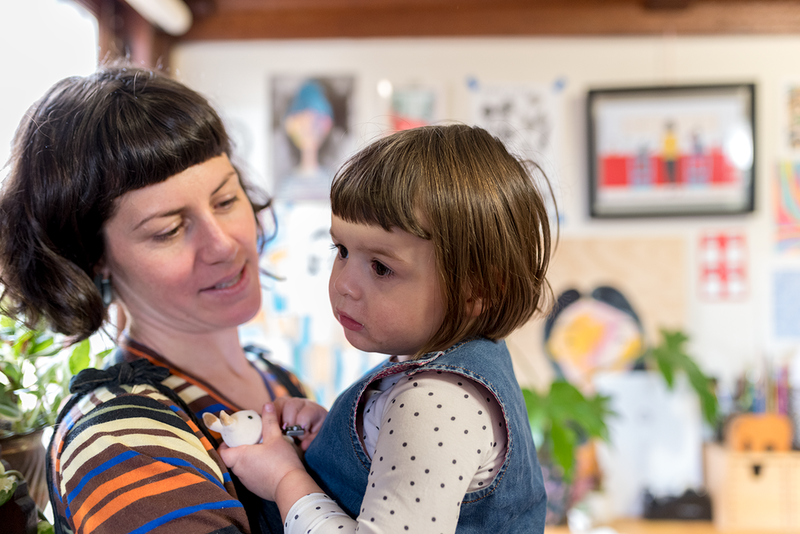 Chatting to Madeleine, I discovered she began her creative life as a ceramicist, producing large-scale sculptural pieces, but 10 years ago she picked up paint brushes and started illustrating and hasn't looked back. She now splits her work time between her new studio and teaching art part-time 2 days a week to primary school children. Madeleine's illustration work features strong, decorative line work, bold, folk-inspired patterns, Mexican-inspired motifs and quirky Australiana themes. 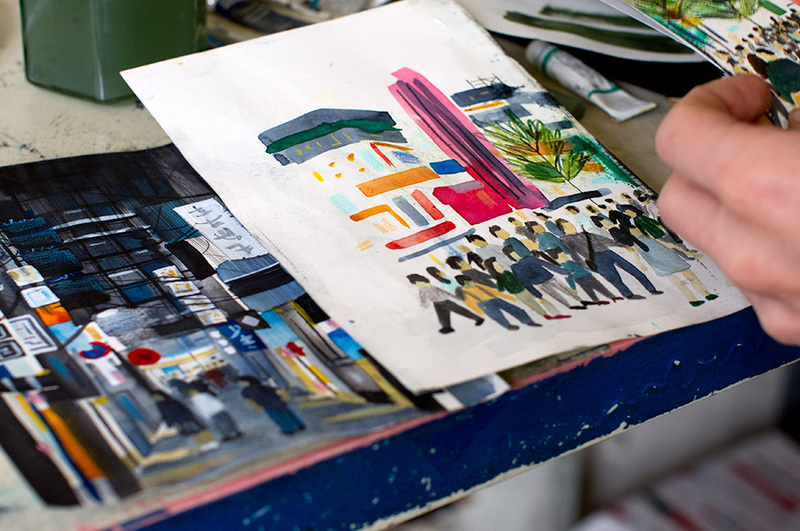 She works on large-scale paper and often starts with a rough sketch, then uses traditional brush and ink work and finally, watercolours, to bring her ideas to life. She then produces small print runs of her work, along with other limited edition pieces, which you can buy from her shop. 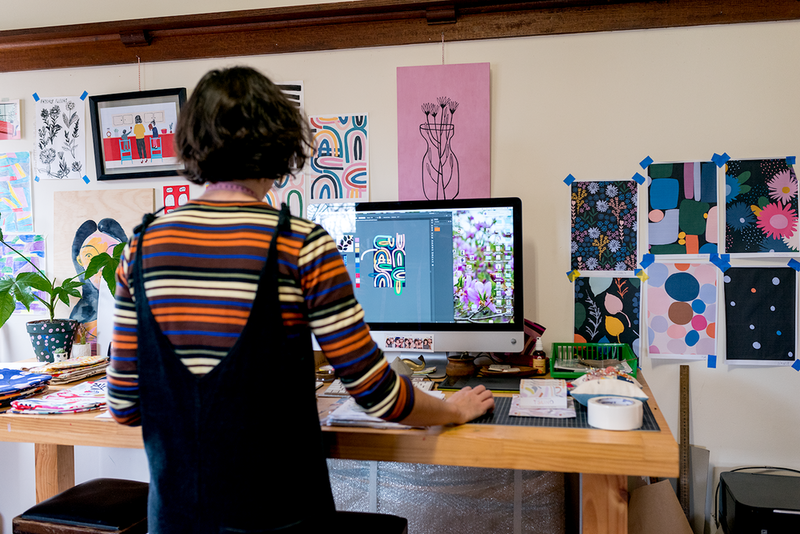 I asked Madeleine some questions about her work and workspace, here they are. Our builder began transforming our old shed mid-2015 and completed work around September the same year. It took me a few months to properly transition into the studio. A large chunk of my materials and furniture remained in the house where I worked prior. Over the years I’ve been fortunate to share studio spaces with some really amazing creatives but I’ve come to realize that I work best from home, which involves less chatting and procrastination. How many hours a week do you spend there? Not as much as I’d like at the moment but once the kids resume school I’ll knuckle down into a few new projects. It would do my head in if I had to clock on and off but if I have an urgent deadline, you’ll find me in there around the clock. Otherwise, I’m in and out processing orders or bunkering down for a few solid hours here and there, creating new work. I’ve only recently moved in but I’m sure the coziness, solitude and sweet tunes will reveal its magic within my work over the coming months. I’m looking forward to working through the seasons, daydreaming and staring out of the big window, taking in the garden - it will all play its part. I truly have my dream workspace, lucky me!!! It’s been nearly 20 years in the making but I can finally say I’ve hit the jackpot! My husband and I bit the bullet mid 2015 and decided to transform our old tin garage into a studio. We kept the existing concrete slab and internal framework of the old garage. The original garage was longer than necessary, so we chopped off a third to gain more garden. Our excellent builder, Mr. Radbuild, re-clad the exterior, re-roofed it and he custom built a massive square window inspired by a cute little barn style home that I spotted on Pinterest. I rely on natural light during the day and the cool concrete floor is a blessing on super hot days. We’re pleased that we were able to salvage a large portion of the existing structure and introduced a whirlybird for air circulation, keeping the studio as environmentally sustainable as possible. Our liquidambar tree acts as a humongous umbrella in summer, keeping the temp relatively cool. Thanks so much to Madeleine for sharing her wonderful space! Jem Selig Freeman in the Like Butter studio. Photo by Susan Fitzgerald. 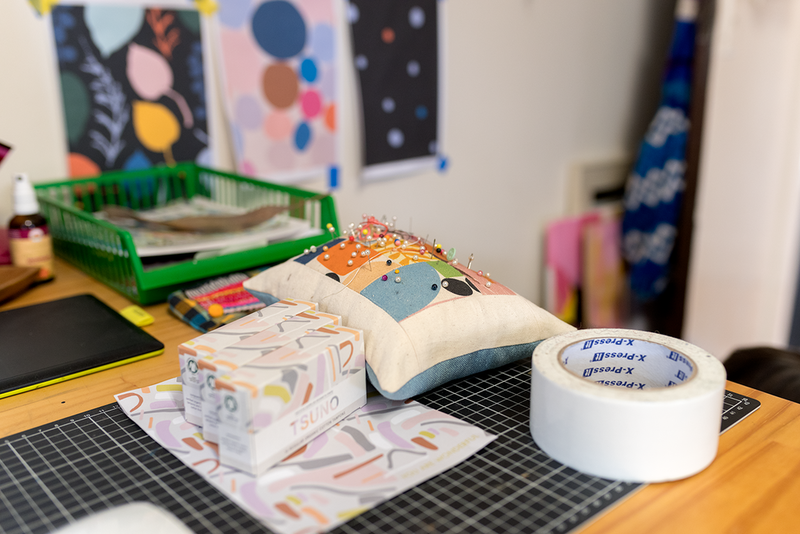 For the latest instalment of Studio Space I visited the amazing Kensington, Melbourne workshop of Like Butter, a design and fabrication business owned and run by industrial designer Jem Selig Freeman and sculptor Laura Woodward. You've probably seen their work around town, much of it made from ply &/or steel - they make quirky bookshelves, distinctive crates, stools, tables and more. When I met Jem and Laura in around 2008 they worked from the basement of the Younghusband Woolstores (where I once had a studio). For the last 14 months they've been in a huge, light-filled space at the front of the same building complex. Jem says he spends about 60 hours a week there, which doesn't surprise me - he's often posting Instagram updates of his creations at all times of the day or night. And what does a dream workspace look like? According to Jem, it would be "bright white with bags of natural light and amazing dust extraction". In the meantime, they look pretty well settled in their current space. I hope you enjoy taking a look around. Jem's inspiration: Sonia Rentsch, Moth Design, Laura Woodward. Like Butter's workshop exterior, on Elizabeth Street. Photo by Susan Fitzgerald. Tools of the trade. Photo by Susan Fitzgerald. So much ply. Photo by Susan Fitzgerald. Seats in the making. Photo by Susan Fitzgerald. This is just part of the huge workshop. Photo by Susan Fitzgerald. The welding area. I'm glad to know I'm not the only one who still listens to a super old radio/cassette deck. Photo by Susan Fitzgerald. Job sheets. Photo by Susan Fitzgerald. Such great bright windows. Photo by Susan Fitzgerald. Crates! Photo by Susan Fitzgerald. Crate number 618. Photo by Susan Fitzgerald. Beware of cats. Photo by Susan Fitzgerald. Studio door. Photo by Susan Fitzgerald. The Kensington station underpass, just around the corner. Photo by Susan Fitzgerald.